In 2006, Carlos Fuente Jr. celebrated the 20th anniversary of Ashton Cigars buy creating the Ashton Estate Sun Grown line. Each of these hand-rolled premium cigars are infused with Dominican long-fillers, binders and tobacco blends rolled up to perfection with a thick, oily Sun Grown wrapper. Grown and nurtured on Château de la Fuente farm in the Dominican Republic, every aged tobacco leaf used for the Ashton ESG premium cigar line is cultivated to perfection. The unique taste of these hand rolled cigars is what attracts cigar enthusiasts’ to search out and try them. 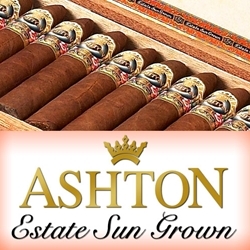 Hints of spice with a commitment to sweet cayenne pepper providing a rich and creaming elegant note is what makes Ashton Estate Sun Grown premium cigars so irresistible. Try any of the Ashton ESG 20, 21, 22, 23 or 24 Year Salutes listed below at our online cigar store. Each will give you a full-bodied smoking experience that is smooth and relaxing from start to finish. Smokers Discounts can bring Ashton Estate Sun Grown premium cigars right to your doorstep. We’ve made it easy and affordable to buy premium cigars online. A variety of sizes and flavors are listed below. Each of these styles are in stock and available for a low discount price! Call us for more details!